Fabiana Elisa Martínez was born and raised in Buenos Aires, Argentina. From a very young age she showed a special interest in books and "words in other languages." Fabiana graduated with Honors from the UCA University in Buenos Aires with a degree of Profesora en Letras (Linguistics and World Literature). She soon started teaching Spanish as a second language and perfected her method which she has used to teach in preeminent international companies as well as to professionals from various countries. Fabiana speaks five languages: Spanish, English, French, Portuguese, and Italian, and has degrees in Ancient Greek and Latin. She lives and works in Dallas, Texas. 12 Random Words / 12 Palabras al Azar is her first work of fiction. 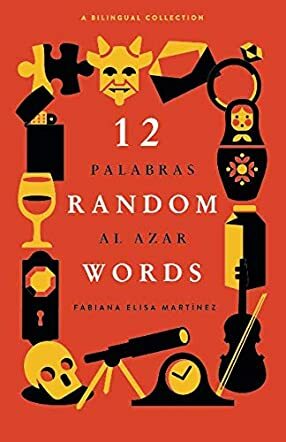 Fabiana Elisa Martinez's 12 Random Words/12 Palabras al Azar: A Bilingual Collection is a wonderful collection of short stories. The author cleverly takes twelve random words and, from this, she builds a story around them. It is the concept of this book that appealed to me initially, but upon finishing the collection, it is the writing that completely drew me in. Every story is built with very strong characters, descriptive surroundings, and a storyline that is unique and appealing. Very quickly, I found comfort and poise in the author’s style of writing, the way she brings you into the stories and keeps you turning pages with every twist of the plot. The author also writes all the stories in both English and Spanish so the collection will certainly engage and reach a much broader audience. What I enjoyed most about 12 Random Words/12 Palabras al Azar: A Bilingual Collection is that it can be read in one sitting, or you can pick it up and read a story, and put it down. The stories each have their own uniqueness, and some I found that I was tagging as a favourite. The complex human emotions and the intrigue of each story will keep readers wanting to turn to the next story, and wanting more. Fabiana Elisa Martinez has a gift for storytelling, and I highly recommend this interesting and unique collection of short stories that are structured in a bilingual format to give this book a unique edge.